Get ready for Coquitlam real estate’s tallest residential tower! 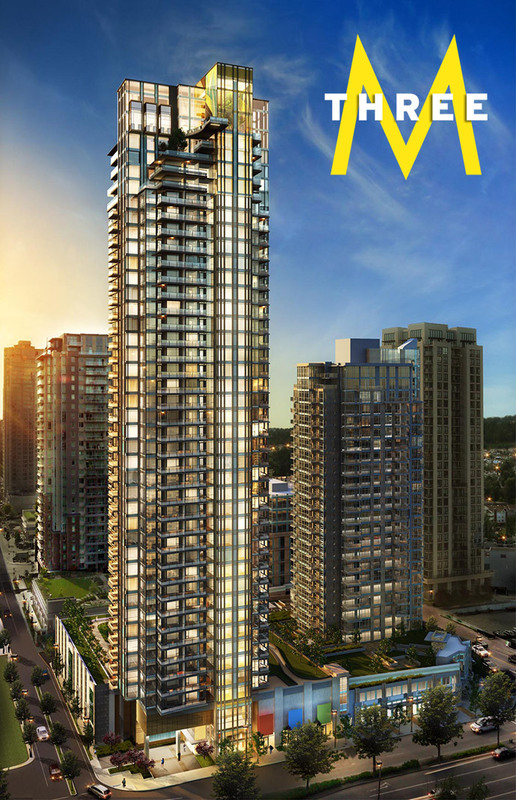 Introducing the new MTHREE Coquitlam condo high-rise that will forever change the city’s skyline. Following the highly successful launches of the MOne and MTwo Coquitlam Metropolitan Residences master planned condominium community, Cressey embarks on a new tower called MThree Coquitlam Metropolitan Residences that will far surpass the luxury, craftsmanship and affordability of its predecessors. The pre-construction Coquitlam MThree Condos for sale will be the tallest tower in the Tri-Cities at 42 stories in height and will quickly become the architectural landmark high-rise. Not only that, but the Metropolitan MThree Coquitlam condo tower will present a stunning two level amenity space at the pinnacle of the high-rise, giving residents more than 6,000 square feet of onsite amenities to choose from year round. Not only that, but the MThree Coquitlam condos will be the final Metropolitan Tower, so this is your last chance to purchase a new condominium residence in Coquitlam Town Centre’s most successful community built and designed by Cressey, one of our favourite local developers. In addition to the exceptional Cressey kitchen and great floorplans you can expect from this renowned developer, MThree Coquitlam will feature The Summit Club at Metropolitan Residences, a 7400 square foot clubhouse in the sky with panoramic views from the top of the M3 Coquitlam Condo tower. You can register for MThree Coquitlam Town Centre condos online at www.liveatmthree.com as there is an expected Fall 2012 presales launch coming soon for pre-registrants. The M3 Coquitlam project site is located at Pinetree Way & Atlantic Avenue Coquitlam BC. • Final opportunity in the celebrated Metropolitan Series. • One Bedroom MThree Coquitlam homes from $224,900! • Two Bedroom MThree Coquitlam homes from $329,900! The Tallest Building in the Coquitlam Real Estate Market is Here! 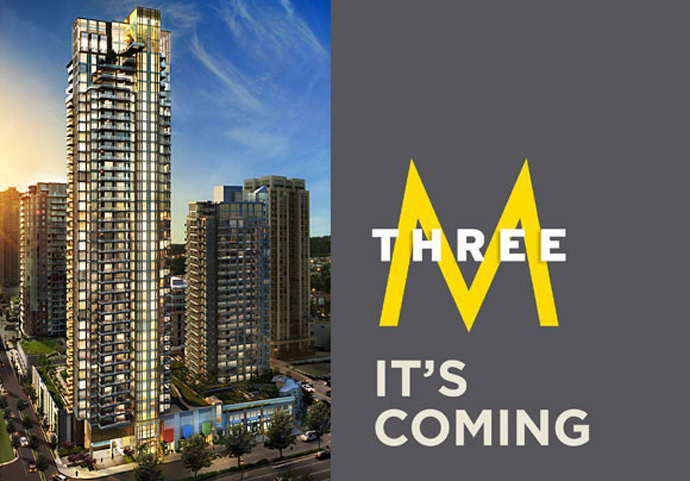 From the MThree Coquitlam email desk > We are thrilled to announce the last and final building in the Metropolitan Series, MThree Coquitlam high-rise, is coming soon. A staggering 48 levels high, MThree will be Coquitlam real estate’s Tallest Tower and one of the highest residential towers in the Lower Mainland! As a registrant with the Cressey Coquitlam Metropolitan Series, you are the first to know about this exciting new opportunity! EXPERIENCE LIFE AT THE TOP > The crown jewel of the preconstruction Coquitlam MThree tower will surely be the MThree Summit Club. Located on the top two-levels of the MThree Coquitlam condo tower, the Summit Club at MThree is the highest amenity in Metro Vancouver outside of downtown. Explore over 9,000 square feet of recreation and relaxation while enjoying panoramic views. Work out in our state-of-the-art fitness rooms, relax in the indoor garden, play ping pong or pool with friends, or have a barbeque in the outdoor living room. It’s all at the Summit Club at MThree Coquitlam by Cressey Developers. LIVING IN A CRESSEY HOME > MOne and MTwo set a precedent for livability, design and quality in Coquitlam Town Centre real estate market. Now, the preconstruction Coquitlam MThree high-rise brings innovative new features to the classic hallmarks of Cressey design. MThree Condos in Coquitlam Town Centre features spacious and efficient floorplans, ample storage, wide-plank laminate flooring throughout the home and integrated European appliances in the famous CresseyKitchen™. In order to ensure you receive timely information about this exciting new opportunity, register now by visiting www.liveatMThree.com. To continue to stay up-to-date on Cressey news, follow us on Twitter and Like us on Facebook! As a priority registrant of MThree by Cressey, here is your first glimpse of this final tower in the celebrated Metropolitan Residences in Coquitlam real estate market. A staggering 48 levels high, MThree will be Coquitlam real estate’s tallest tower. And, topped by a 9,000 square foot MThree Summit Club clubhouse in the sky, it will also be Coquitlam’s best! Designed by Rositch Hemphill Architects, MThree Coquitlam condo tower promises to be the most iconic building in the skyline. Cressey recognized the opportunity to create something special with Coquitlam real estate’s tallest tower. With a prominent location in Coquitlam City Centre, just steps away from the Evergreen Line and convenient, everyday amenities, MThree Coquitlam’s architectural feature shines like a beacon at the top of the tower from The Summit Club. Located on the top two-levels, the Summit Club at MThree Coquitlam condo tower is the highest amenity in Metro Vancouver outside of downtown. 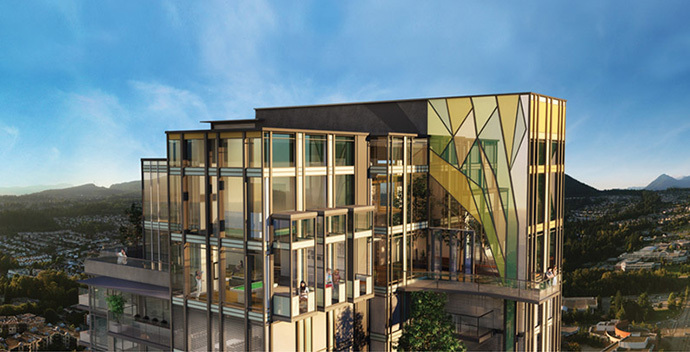 Comprised of over 9,000 square feet of recreation and relaxation, you can enjoy state-of-the-art fitness studios, a games room, music studio, and panoramic views from its signature room and architectural inspiration, the Garden Atrium at The Summit Club MThree Coquitlam. Soaring, 30′ high ceilings and overheight windows surround you while you rest and rejuvenate year-round underneath mature, planted trees. These trees inspired our architects to create the iconic MThree Coquitlam condo tower, and they will inspire you in your daily life as well. Just as MOne and MTwo set a precedent for livability, design and quality in Coquitlam Town Centre, MThree Coquitlam condo tower brings innovative new features to the classic hallmarks of Cressey design. The pre-construction Coquitlam MThree high-rise features spacious and efficient floorplans, ample storage, wide-plank laminate flooring throughout the home and integrated European appliances in the famous CresseyKitchen™. If you look at the Lower Mainland real estate market and the infrastructure spending in the GVRD, no municipality comes close to the investment dollars going into Coquitlam and the Tri-Cities. Not only is Coquitlam getting the Evergreen SkyTrain Line, but there are many high-rise towers in proposal, planning and presales phases. One such project is MThree Coquitlam Condo Tower, which will become the tallest high-rise in the Coquitlam real estate market. As part of the Metropolitan Residences Coquitlam master planned condo community, the MThree condos is the third in the series of Cressey towers located within Coquitlam Town Centre. The city allowed Cressey to go to the maximum density and as part of this collaboration, Cressey is helping to build the Lincoln Transit Station at Pinetree Way on the Evergreen Skytrain Line that will start running in mid 2016. The SkyTrain will be within walking distance from MThree Coquitlam Metropolitan Residences, making it truly accessible for home owners who don’t want to drive everywhere or don’t even own a car. The zoning for the pre-construction Coquitlam MThree condo tower went from 2.5 FSR to 5.0 FSR and the bonus money that Cressey is pumping into the infrastructure of the Coquitlam Town Centre community will be over $20 million towards the Evergreen SkyTrain Line. The latest news for the M3 Coquitlam condos is that there will be a total of 319 condominium residences that will start affordably from the $230,000’s range for one bedroom suites. In addition, there will be approximately 8,000 square feet of ground floor prime retail space available at the pre-construction Coquitlam M3 condos by Cressey. As such, it is expected that Coquitlam will continue leading the Lower Mainland in terms of growth and will be one of the fastest growing metropolitan centres in the area. From the Cressey email desk > Thank you for registering for MThree Coquitlam real estate’s Tallest Tower by Cressey. Rising 42 stories, this architectural landmark will be topped by a stunning, two-level amenity spread out over six thousand square feet. Metropolitan Residences Coquitlam MThree condo tower will offer one, two and three bedroom condominium homes featuring the famous Cressey Kitchen. Designed as a highly functional workspace, the Cressey Kitchen can be identified by its sleek appliances, ample storage and efficient walkthrough layout. The MThree Coquitlam M3 Condo building will continue Cressey’s commitment to superior design and quality construction, as evidenced by the highly successful MOne and MTwo buildings in Coquitlam’s Metropolitan Series. Cressey Development Group will start presales for the MThree Coquitlam M3 condos that will stand at Glen Drive and Pinetree Way (according to The Province newspaper) and there will be a total of 319 suites for sale in almost 400 feet or 42 storeys, making this the tallest Coquitlam highrise ever. With improved finishes and higher level of architectural highlights, this will be the landmark Coquitlam condo high-rise by Cressey Development Group. “Dramatic” is how Cressey describes this new Coquitlam M3 condo tower, which will be part of the neighbouring MOne and MTwo Metropolitan Residences master planned community. 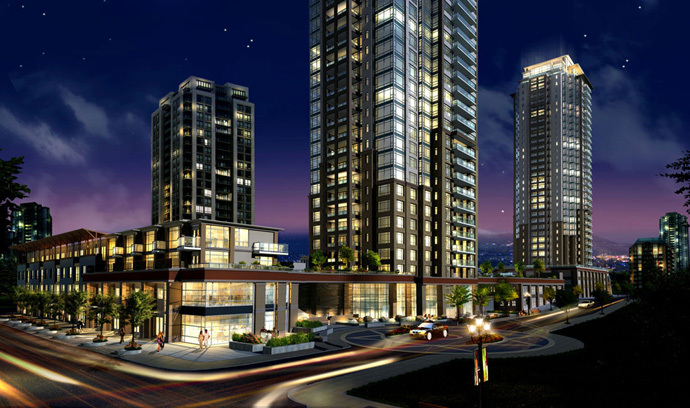 MOne Coquitlam is already completed with move-ins scheduled for mid 2012 to late 2012. MTwo is almost sold out already. MThree Coquitlam Metropolitan Residences will be 17 storeys taller than MTwo as well. This pedestrian friendly and walkable neighbourhood is already going through a huge renaissance with new residential towers and commercial office space entering the Town Centre district already. In addition, the connection with the Evergreen SkyTrain Line which is set for completion in 2016 will make the M3 Coquitlam MThree condo tower even more accessible and liveable. This is really your first ground level opportunity to get into the market before the transit infrastructure is completed. The last and final building in the Cressey Metropolitan Series community, MThree Coquitlam condo tower is launching right now! A staggering 48 levels high, MThree Tower will be Coquitlam real estate’s Tallest Tower. EXPERIENCE LIFE AT THE TOP > The crown jewel of MThree Coquitlam high-rise tower will surely be the Summit Club at MThree. Located on the top two-levels of the MThree Coquitlam condo tower, the Summit Club is the highest amenity in Metro Vancouver outside of downtown. Explore over 9,000 square feet of recreation and relaxation while enjoying panoramic views. Work out in our state-of-the-art fitness rooms, relax in the indoor garden, play ping pong or pool with friends, or have a barbeque in the outdoor living room. It’s all at the Summit Club at MThree Coquitlam. LIVING IN A CRESSEY MTHREE HOME > MOne and MTwo set a precedent for livability, design and quality in Coquitlam Town Centre. Now, the pre-construction Coquitlam MThree condos bring innovative new features to the classic hallmarks of Cressey design. MThree Coquitlam pre-construction condos feature spacious and efficient floorplans, ample storage, wide-plank laminate flooring throughout the home and integrated European appliances in the famous CresseyKitchen™.